With passenger comfort its primary function, the Century Yaw Damper is an independent subsystem compatible with any autopilot system. It enhances directional stability by eliminating short-term yaw oscillations. It assures exact coordination in all turns and maneuvers through the use of an exclusive rate gyro and electrolytic potentiometer (skid sensor), thus reducing pilot workload. These composite signals are tuned to the natural yaw frequency of each aircraft model for maximum performance. Century Flight Systems offers several different models of Yaw Damper systems. These yaw dampers are considered stand-alone systems unless they are approved as part of the autopilot system. Some of the yaw damper systems have the capability to be inter-connected to the autopilot systems to provide full three axis control when the autopilot is engaged and disengagement of the yaw damper when the autopilot master disconnect is used. The Century 41 autopilot system and the 1C753-100 and 200 series yaw computer can be interconnected to allow the engagement of the yaw damper when the Century 41 autopilot is engaged. Disengagement of the autopilot through the use of the ON-OFF button on the autopilot programmer or activation of the electric trim switch will not disengage the yaw damper. The yaw damper can only be deactivated by use of the AP Disconnect/Trim Interrupt switch on the control wheel or by depressing the ON-OFF switch on the Yaw Controller. The 1C753-( ) or the 1C651-( ) yaw damper systems can be used with the Century 41 autopilot system, but cannot be interconnected for the single action of engage or disengagement. These yaw damper systems have a panel mounted ON-OFF switch that must be activated. The Century 2000 autopilot system is essentially just like the Century 41 autopilot as far as the yaw damper system is concerned with one difference. 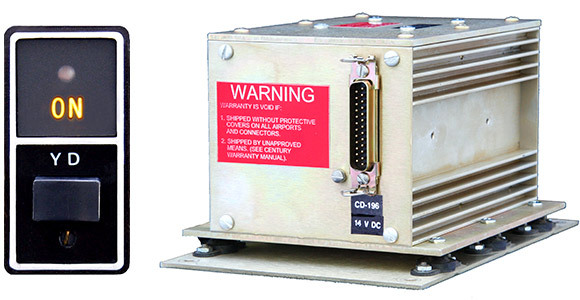 The Century 2000 does not use the yaw damper controller in the 1C753-100 & 200 series. The Century 2000 has the capability to annunciate yaw damper engagement, adjust yaw damper centering and provide an ON-OFF switch. The 1C753-( ) or the 1C651-( ) yaw damper system can also be used with the Century 2000 but cannot be interconnected for engagement or disengagement. For today's high performance aircraft, it is that final touch of refinement required by conscientious pilots.